6571 – This dress is pretty cute. I like the square neckline, and the sleeve options are nice. I was pretty convinced I didn’t need to add it to the stash, but it grows on me the more I look at it. 6572 – These straight silhouettes do nothing for me, but I have seen a lot of people rocking these jumper styles lately, so I can see the appeal. This looks like a pretty simple pattern too, which could be nice to quickly add pieces to a fall wardrobe. 6573 – I feel like this is a simple dress and a simple oversized cardigan, but somehow the overall effect is really great. I really like the lines of the dress, even though it is relatively simple. 6574 – This dress has some cute features and nice raglan sleeve options. It would be great in a dark fall floral. 6575 – These tops have a really low v-neck; I would probably wear them over a cami, or I’d have to adjust the neckline. Otherwise, they look really loose and comfortable. 6577 – I can honestly say I recommend this pattern, since it is half of the styles from Simplicity 1716, which I’ve made. It is one of my favorite tops, so this should be a really nice pattern. Can’t say I like the styling New Look used here (sorry, I have a deep-seated hatred of cheap crushed velvet), and it’s sort of lame that you only get half the styles that came in the original pattern, but this is a cute top. 6579 – After the previous pattern I’ve started questioning how many of these patterns are actually new, because I feel like I’ve seen a lot of similar skirts in the past. The ruffle detail is pretty cute though; very fun for fall. There are also lots of fun pocket details in this pattern. 6580 – This is a pretty basic skirt pattern. I’ve added a lot of circle skirts to the stash already so I don’t feel like I need this, but this style skirt is always nice. 6581 – These easy knit styles sort of skirt the line between day wear and lounge wear. Possibly in the category of secret pajamas? I think this is a pass for me, but I could see the appeal of a comfy, casual wrap top. 6583 – The 80s trend is super apparent in this jacket. I do love the jewel tones that they’ve chosen to style with, but I’m not really looking for the ruffle hem or giant shoulder details. I feel like this pattern is on trend, it’s just not the trends I’m excited about. 6582 – More casual pieces that would be really easy to sew as well. Nothing here that I need, but the top has simple chic appeal. 6585 – This coat is one of those that looks cozy, but also borders on bathrobe. I think the styling and fabric choice really help to elevate it though. Plus, this looks like it would be a really easy coat project, which could be a great pattern for someone who wants to sew a coat but is nervous about tackling anything with complex details. 6586 – This coat/cape pattern has some more yummy details, but the dolman sleeves do simplify the sewing a bit. Love the high collar, back tab details, and length options. 6588 – Whenever a pattern is presented as “unisex” I think of it as being a man’s pattern, because, honestly, you lose a lot of the shaping that helps with fit. Even on the model the hips look too tight and the shoulders look too wide. The guy looks fine though. The hood option has a cool neckline detail, but I feel like the pockets are somewhat oddly placed? 6590 – Kids jacket/vest pattern. Looks pretty simple, which I feel is probably good for kids since they outgrow things so quickly. 6591 – Ruffly back to school dress. A bit Little House on the Prairie for me, but I suppose it is kind of cute? 6592 – This “tweens” pattern has some interesting pieces. The leggings will likely be the most requested look, as I can’t see kids wanting a ton of cropped ruffle jackets, but I could see the jumper dress being a staple. 6398 – I love this! So many great details, even though it’s clearly going to eat up yards and yards of fabric. 6399 – The guy’s pattern is pretty simple, but the shirt does have some nice detailing. And the tunic does have some nice seams for shaping. And that’s it! What do you all think? See anything from New Look that’s making it onto your fall sewing plans? Or are you similarly uninspired by the 80s throwback looks that are coming out this fall? Did you see any other Simplicity reprints that I missed? Feel free to discuss in the comments! 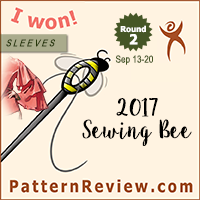 Possibly a Pattern Review Contest? That is the one pattern I’m eyeing from this release as well. Now I’m pondering… if you figure something out let us know! The drapy top is one I’d try, and even try it in a velvet… One store had a crushed velvet fabric that look a bit like distressed… something or other… and it looked really nice! Horribly pricey though. LOVE the Burda GoT patterns. 6577 is a Simplicity I’ve sewn several times…years ago. Gah. I hate that they reissue this way. 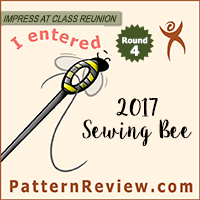 I saw nothing that moved me – but I am so not into square necklines and there seems to be a lot of square or squareish ones here. I’m really liking this release. I think it helps that they’ve used fairly plain fabrics for the samples so the lines are visible.